The Takeaway: For consumers, mobile devices play a variety of different roles in the shopping experience. That means your brand must wholly consider mobile as a platform and mobile shopping behaviors when creating and optimizing product content. You might call it mobile shopping: the act of using a smartphone or tablet to browse product selections and make purchases. However, using the term "mobile shopping" is a bit disingenuous.That's because shopping today isn't a siloed process. Consumers aren't just using a single channel to "shop" - to discover, learn about and buy products. That still happens, but it's far more likely that your shoppers are taking a brand new path to purchase, and that journey brings them across multiple channels. In other words, it's not "mobile shopping" - it's shopping in the age of distributed commerce, and mobile devices are just one tool at consumers' disposal. For example, Google found that 82 percent of shoppers use their smartphones while shopping in-store. These consumers are searching for product content and additional information to inform their purchase decisions. "It's not 'mobile shopping' - it's shopping in the age of distributed commerce." Then there are the shoppers who use their smartphones to research stores nearby. According to Google, 76 percent of people who search for items locally on mobile will head to a store that same day. Or how about the 66 percent of consumers who pull out their mobile devices after seeing a commercial? These individuals are "shopping" on their smartphones, but they could choose to buy digitally or physically. And you cannot forget your customers who browse and buy on mobile simply because they want the ability to shop whenever and wherever they choose. A study reported by Computer Weekly said that almost 40 percent of London commuters shop while on the Tube, for example. These aren't all different groups of shoppers - there's a lot of overlap. "Mobile shopping" - in all its various forms - is the new retail norm. Yet many brands and retailers are still struggling to provide exceptional experiences on mobile sites and apps. Our latest consumer research report, "Cracking the Consumer Code," found that the No. 1 pet peeve of mobile shoppers is a lack of a mobile-optimized experience. So we've compiled five tips for how to improve your product content for the current state of mobile shopping. As explained above, there are many different ways to shop on mobile. 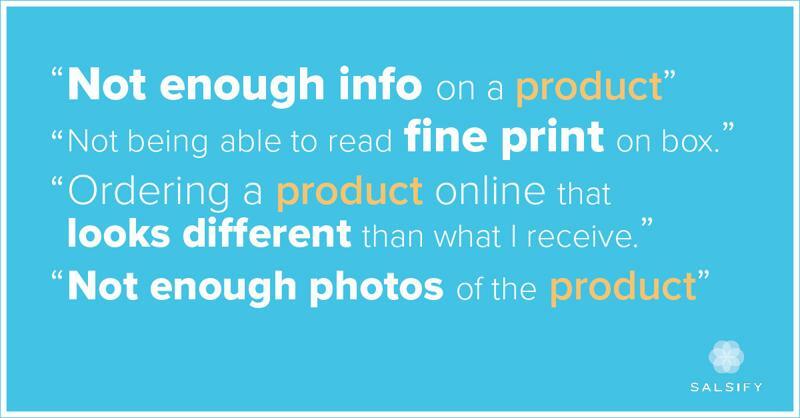 You must take each of those contexts into consideration when creating product content. Ask yourself where on the path to purchase consumers might search for your products and why they would do so. This ensures that you're answering shoppers' questions at the right moment with the right product content. Google calls these "micro-moments": Do consumers want to buy, learn, discover, etc., and is your brand fulfilling each of those needs with specific product content? Product imagery plays a large role in purchase decisions. (Check out this blog post for more info.) That means you need to devote resources to upgrading your images on all channels, mobile included. Make your images big and give shoppers control over zooming in and out. That means your product imagery must be detailed. Beyond that, give shoppers complete 360-degree views of your product, especially if your labels have fine print, ingredients lists or other detailed specifications. Shoppers' biggest mobile shopping pet peeves --- For more consumer research, check out "Cracking the Consumer Code." Don't limit your product content to text and images. While that might sound like a good strategy for shoppers who are on-the-go, consumers still want to replicate the in-store experience while on mobile. That's possible if you use a variety of types of product content. For example, 48 percent of smartphone users are more apt to purchase from a brand that provides instructional video content on its mobile site. Meanwhile, user-generated product reviews can help secure an in-store sale if they're easily discoverable on search. "51% of shoppers discover new brands and products via mobile search." Mobile search is your ticket to driving conversions with product content. Google found that 51 percent of smartphone users discover new brands and products when searching on mobile, and 65 percent seek out "the most relevant information regardless of the company providing the information." Show up first in search results, and you'll win sales. But that's easier said than done. So conduct some research, discover what your customers are Googling and put those terms in your product titles and content. Respect your shoppers' time when they're using smartphones. After all, they might be searching for product information while in the aisles of a store, and you don't want to keep them waiting with long loading times or force them to jump through digital hurdles to find the content they need. Prioritize product content on your product pages by putting the most valuable information first, and consider keeping customer reviews on the upper half of those sites.